Our SL-002 overhead ionizer, powerful performance, outstanding reliability and preferred over our competitors by major companies world wide. At United we believe in saving your ESD program a substantial amount of money! Our SL-002's feature a light weight construction (important when mounting overhead) in combination with high volume, high output dual fan air displacement. The SL-002's are perfect for medium size esd work stations and esd benches. The SL-002's are quiet, with easily adjustable air flow, provide on demand overhead lighting and have built in emitter point cleaners and heavy duty tungsten emitters for fast, easy maintenance and long life high performance output. Low maintenance. Easy to maintain! Certificate of compliance provided at no charge! Precision + / - 10 volt offset voltage balance! Built in emitter cleaning brush (point cleaner knob). NO further calibration typically required. Mounting brackets included at no charge! CE Certified, designed to last a lifetime! The SL-002 meets or exceeds the recommended technical requirements of ANSI/ESD S 20.20- 2014 tested in accordance with STM3.1. Certificate of calibration included with each unit. Note: Flow amount equals sum of dual fan operation. Installation Fast Facts: Install fluorescent light bulb into ionizer by removing front cover with a screw driver, unpacking bulb, screwing into place and replacing the front panel. 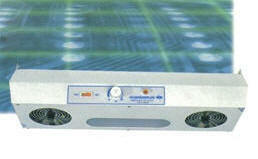 The SL 002 is an overhead unit designed to provide ideal coverage for control of electrostatics. Note: Do not insert objects into air intake or outlet grille and do not operate the SL-002 in inflammable or explosive environments. The SL-002 ionizers should be affixed 600 to 900mm (24 to 36 inches) above the work surface with center targeted directly over work area. Avoid drafty locations such as that caused by air conditioning, heater outlets, etc. Attachment to overhead supports: S hooks and chains may be used for mounting these ionizers to structurally sound ceilings or wire shelves. Chains and mounting hardware should have a minimum safe working load of at least 50 pounds. When mounting the unit to ceilings it is important to check state and local codes to insure compliance. These units are typically hung in the same fashion as an overhead light fixtures (independently attached to the overhead building superstructure). Attachment to suspended ceilings only are typically not compliant with local codes. Mounting to workbench overhead supports: These ionizers may be mounted to work bench overhead shelves and beams using the supplied side mounting bracket in conjunction with angle iron, bolt on L brackets etc. These ionizers may be used either horizontally or vertically. Electrical Requirements: The SL-002 requires 110VAC /60Hz (standard) or 220VAC / 50Hz (optional) power. These units must be grounded. Each unit is supplied with standard US 3 prong male grounded power plug (standard). Do not modify the plug or use an ungrounded 3 prong receptacle. If an extension cord is required use heavy gauge fully grounded cords only. Operating Procedure: Activate the SL-002 overhead ionizing blower by turning fan speed knob clockwise. The ionization indicator will illuminate and indicate the presence of ionized air. Airflow speed can easily be adjusted from 0 to 100% utilizing the fan speed knob. Light is provided via a simple on/off switch. The time required to neutralize electrostatic potential is dependent on distance of ionizer to work surface and speed of fans. When used in electronic assembly the ionized air stream should cover as much of the working area as possible. The constant flow of ionized air prevents items from developing an electrostatic potential and neutralizes electrostatic charges present on items introduced to the airflow. Routine Maintenance: Clean emitters as needed (usually every two to three weeks in heavy service). To clean ion emitter points press and turn point cleaner knob (located at each air outlet) clockwise approximately one turn and release. Clean air inlet and outlets as needed with a soft brush or vacuum. Periodically test ion output as indicated by your internal esd program or ANSI/ESD S 20.20-2007, TR53, Air Ionizer Compliance Verification (discharge time and offset voltage). Offset voltages of > +/- 50 volts or decay times that exceed user defined specifications (typically <1.1 sec @ 60%rH and 68 deg F. with ionizer positioned 24" from work surface) may indicate the need for replacement of emitters. Normal emitter life is 3 years, replacement emitters are easy to install and available from United SCP.